The Redwood City Improvement Association (RICA), a community benefit district that works to enhance Downtown Redwood City, in partnership with the City of Redwood City, installed energy efficient white LED lights in 165 trees over a 8 blocks radius of Downtown Redwood City. 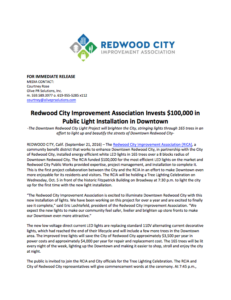 The RCIA funded $100,000 for the most efficient LED lights on the market and Redwood City Public Works provided expertise, project management, and installation to complete it. This is the first project collaboration between the City and the RCIA in an effort to make Downtown even more enjoyable for its residents and visitors. The RCIA will be holding a Tree Lighting Celebration on Wednesday, Oct. 5 in front of the historic Fitzpatrick Building on Broadway at 7:30 p.m. to light the city up for the first time with the new light installation. The new low voltage direct current LED lights are replacing standard 110V alternating current decorative lights, which had reached the end of their lifecycle and will include a few more trees in the Downtown area. The improved tree lights will save the City of Redwood City approximately $3,500 per year in power costs and approximately $4,000 per year for repair and replacement cost. The 165 trees will be lit every night of the week, lighting up the Downtown and making it easier to shop, stroll and enjoy the city at night.